← E-cigarettes and tobacco directive: what’s next? 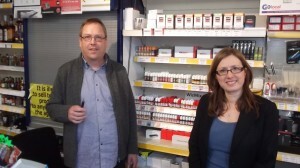 Rebecca Taylor, Lib Dem MEP for Yorkshire and the Humber, has met with a shopkeeper who contacted her and other MEPs to ask them to push for e-cigarettes to be regulated as consumer products not medicines. Retailer Matt Gluggles, who runs Topjuice Retail in York, wrote to Yorkshire MEPs including Rebecca. The campaign to keep e-cigs regulated sensibly and thus more freely available scored an important victory 2 weeks ago when the European Parliament voted against medicines regulation. Rebecca Taylor with Matt Gluggles at Topjuice Retail, in York.